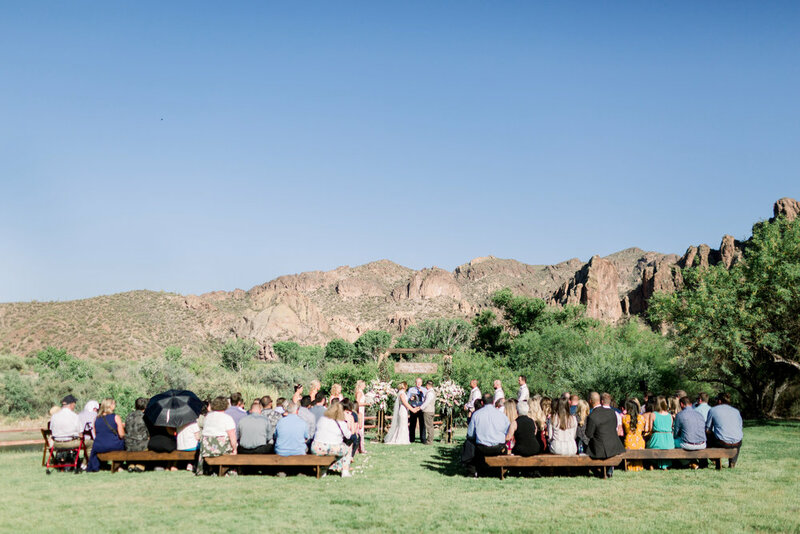 Given their love for country music, cowboy boots and nature it was only fitting for these two lovebirds to have their wedding on a ranch. And what a beautiful setting Saguaro Lake Ranch is nestled between the Salt River and the Bulldog Cliffs in Mesa, AZ. As I was setting up decor I spotted a herd of wild horses drinking from the river bank. Coupled with the quietness from no surrounding homes or businesses it was pure serenity. The property has 20 cabins that accommodated a good majority of their guests who enjoyed tubing down the river, scenic hikes and horseback riding during their weekend stay. It was the perfect way for two families to spend time with one another in creating memories that will last a lifetime.